"In recent years, manga has become and increasingly popular art form across the world, and today it is used in numerous media, from animation to still art. 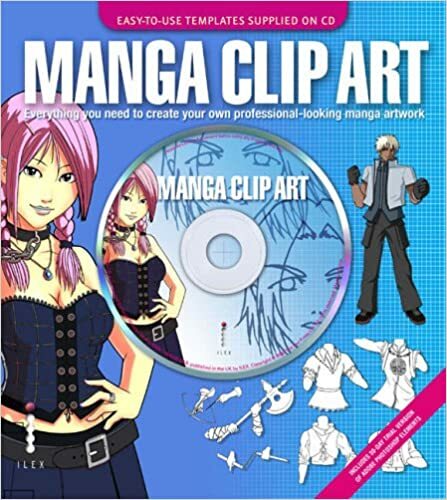 Manga Clip Art will provide you with all the elements you need to create your own ready-to-print, professional-looking, full-colour manga illustrations – even if you don't have any previous experience! If you love manga, you can use the high-resolution clip art to create your very own stunning, personalised artwork, and in next to no time you'll be developing your very own unique manga style. All the elements you'll need to get started are included on the CD. The accompanying book not only explains in detail all the techniques to create, colour and render your own stunning manga illustrations, but also provides inspiration with numerous examples of the latest ideas in this genre – all from professional manga artists". I created the child female and child male illustrations for Manga Clip Art. These are made up from many many elements enabling the reader to create their own illustration from the parts using a graphics program.